The event was held at the Woodbridge Winery near Lodi, California. I had never been to that part of California, and was pleasantly surprised by Lodi. It is not Napa or Sonoma and sits on the edge of the Central Valley. It reminded my wife of Lubbock, Texas “with hills”. That said, the downtown turned out to be charming with lots of wine-tasting rooms, restaurants, and shops. The fields surrounding the town are almost completely taken up by vineyards. Woodbridge was established by Robert Mondavi, but is now owned by a huge conglomerate that bought out Robert Mondavi a number of years ago. Still, it feels committed to the local community and makes a point of sponsoring a number of community-oriented activities throughout the year at its park-like headquarters space. For 12 years it has put on a combined chili cook-off and car show. The cook-off serves as the California state championship with the winner entitled to go to the CASI (Chili Appreciation Society International) World Championship in Terlingua, Texas. That’s sort of the chili equivalent of the Burning Man in Nevada. This year the contest attracted entrants from all over California as well as from as far away as Illinois and Kansas. The reigning world champion along with two former world champions were cooking. The car show was huge. There were hundreds of cars of all ages, makes, and models. They were all in mint condition. There were other things to do as well, so that the crowd was in the thousands, most of whom were anxious to taste chili, guacamole, and salsa that were prepared for respective contests. I tagged along with my friend,, Reggie Graves, who is himself a champion chili cook who has won many contests throughout Louisiana, Texas, and Arkansas. 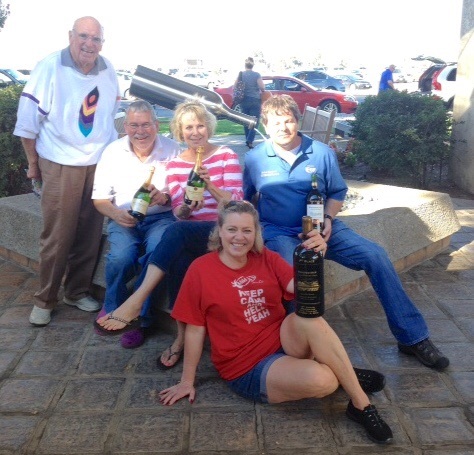 We decided to enter all three contests. Reggie was in the Top Ten chili cooks. I was not. And we also didn’t win in the guacamole or salsa contests. That’s just the way it goes. I’m in San Francisco right now, after the California Chili Cook-Off in Lodi. (More about that in another post.) Last night, Sarah, our chef-daughter, cooked dinner. Originally she planned to go to the grocery store, but ultimately decided to clear out her refrigerator. Needless to say, her made-up dish using leftovers and odds and ends turned out to be better than anything I could have cooked. The dish combines chicken and pork chop (left over from my chili cook-off venture) with pasta in a simple but delicious sauce seasoned with herbs de Santa Fe*. The side dish was a tomato and burrata salad with an herb vinaigrette. It was a delicious dinner with very little fuss. * Herbs de Santa Fe is a mix of lavender, rosemary, thyme, savory, fennel seed, basil, and marjoram. You could substitute Italian seasoning. Heat the schmaltz in a medium sauté pan over medium-high heat. Add the pork and chicken, browning lightly. Stir in the herbs and hard cider and bring to a boil. Reduce the heat to a very slow boil and cook until the liquid is reduced by half. Add lemon juice to taste. Meanwhile, in a small sauté pan, heat the olive oil. Add the kale, mushrooms, and red onion. Sauté until cooked through. Set aside. When the cider has reduced, stir in the sautéed kale, mushrooms, and red onion. Add enough pasta to suit your taste. Correct the seasoning with salt and pepper. Top with freshly grated Parmesan. Serve immediately. 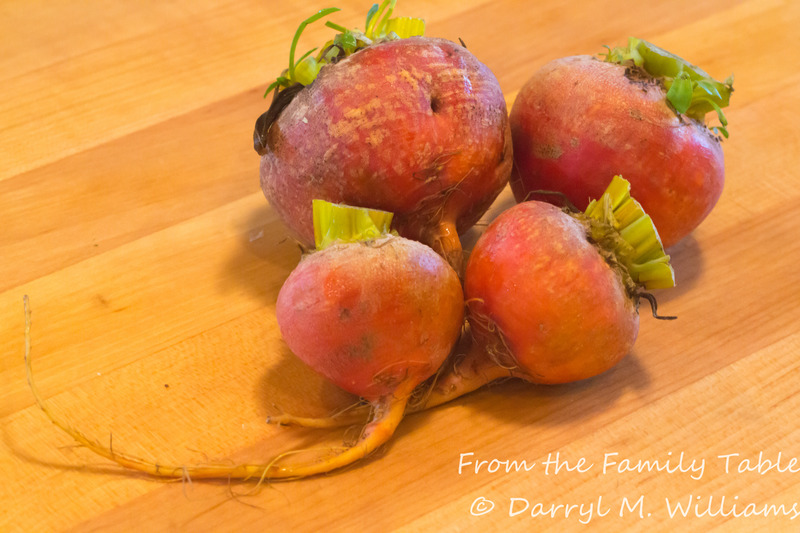 The weather has definitely shifted to autumn, and the farmers market has begun to wind down. The other day, one of the vendors had piles of different squashes, none of them with labels. I saw a beautiful winter squash that would make a great soup. I thought I was buying a calabaza, but when I got it home it turned out to be a zucchini-like globe squash. 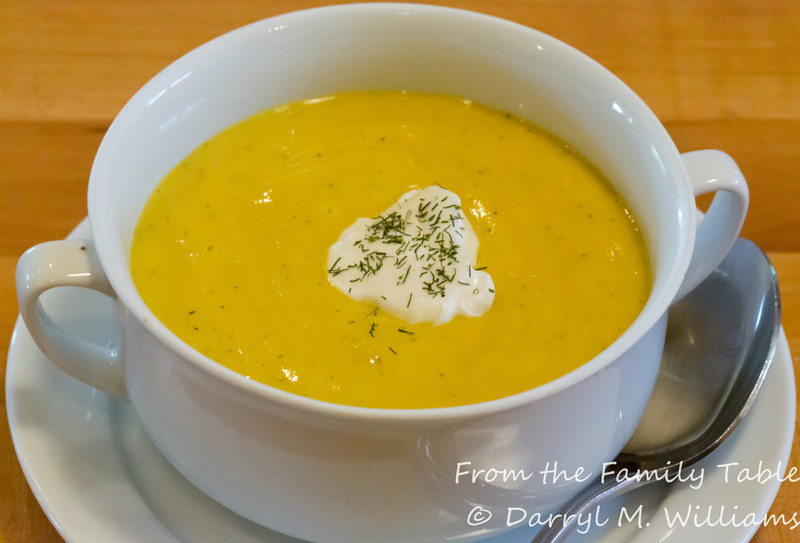 Yes, I can hear you saying, “Another zucchini recipe.” I split the squash in half, and roasted it anyway, and it turned out to make a savory soup that was just right for a cool autumn lunch. You can make it vegetarian by using vegetable stock. 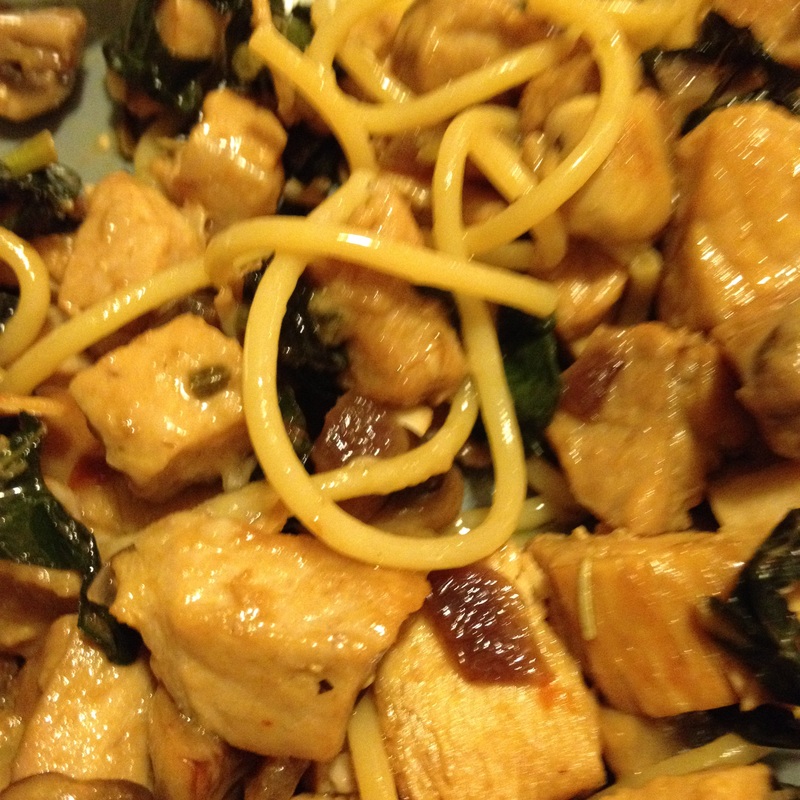 You could even make it vegan by substituting vegetable oil for the butter and silky tofu for the cream. Meanwhile, in a 4-quart covered saucepan sweat the onions in 2 tablespoons olive oil over medium heat. Do not allow the onions to brown. Add the rice, and stir until the grains have become translucent. Add the stock and bring to the boil. Reduce to the simmer, covered, for 30 minutes or until the rice is completely cooked and soft. Stir in the squash, return to the boil, and then simmer for another 5 minutes. Remove from the heat, and cool enough to work with easily. Puree with a blender. You may need to work in batches. Return the soup to the saucepan,, add cream, and bring to the simmer. Do not boil. Add nutmeg to taste and adjust seasoning with salt and pepper. In a small sauté pan, heat the remaining 2 tablespoons olive oil over medium flame. Add the garlic and stir until the garlic starts to brown. Remove the garlic and add the bread cubes. Sauté until crisp and lightly browned. Drain the croutons on paper towels and salt lightly. The aspen colors are at their height right now, so the other day we took a drive up Hyde Park Road to the Ski Basin. Although my knees and back are not as limber as they once were, we walked up a couple of our favorite trails, and I took pictures, in spite of already having hundreds images of golden aspens. The colors are not as multi-hued as they are in New England, but an entire mountainside clothed in bright yellow still elicits a gasp from me, along with the need to take yet another image. We avoid the weekends looking at the colors. It seems as though the entire city makes the pilgrimage on Sunday so that there are traffic jams on the winding mountain roads. During the week, the crowds are smaller, and there is an additional excuse to stop for a late lunch after our viewing and shooting. Toward the bottom of the mountain is one of our favorite restaurants. Izanami has been carefully and beautifully built to resemble a Japanese inn and to afford spectacular mountain views in all directions. . The food and service are also Japanese. The restaurant only opened months ago, and it was a semifinalist for the national James Beard New Restaurant of the Year Award. The food is delicious and so far as I know, authentic (I’ve never been to Japan). Some detractors complain that their peanut sauce is not truly authentic, even though I can find recipes for Japanese peanut sauce on the web. Whatever, the restaurant is the latest addition to Ten Thousand Waves Spa. There are communal baths, massages, and therapies, and Japanese-style lodging. People come from all over the world to enjoy the luxury, and now they have delicious Japanese food to add to the experience. The menu offers many choices, all with Japanese-sounding names. One of our favorites is kinpira gobo (slivered burdock root and carrot served with a sesame soy dressing). Other good choices include red pepper-tomato soup, tofu dengaku (tofu cubes glazed with yuzu-miso), pork belly kakuni, and tonkatsu (panko-breaded pork loin cutlets with hot mustard and miso katsu sauce). A short trip back home, and it was time for a nap. All in all, a great day. California is experiencing a heat wave, and Los Angeles is especially warm. My grandchildren’s schools decided to close early the other day because of the heat – the 90’s – even though the schools sit on the edge of the ocean with ocean breezes. The classrooms are air-conditioned as well. Never mind, the schools closed and parents were asked to pick up their kids, working or not. This decision set my daughter into a fit of pique, especially because she remembered her days in Louisiana where it gets really hot and humid, and the schools were not air-conditioned because the school board considered that a luxury. Carol shared her disgust with her siblings via e-mail, and that stimulated a discussion of all the tribulations they endured while growing up. Among these, was the menu in the school cafeteria. We moved to the South when the two older kids were in elementary school, and they had never had okra. They tasted it for the first time on their first day of school. And the second time…and the third time… and the fourth time… which is to say that stewed tomatoes and okra were served every single day. To this day, none of our kids eats okra. Okra has a well-earned reputation as being slimy. That is especially so when it is boiled or when it is cooked with stewed tomatoes. As a result of this, many refuse to eat okra even though it is possible to prepare it in such a way as to avoid the slime. Mostly this is done by frying with one or another method. 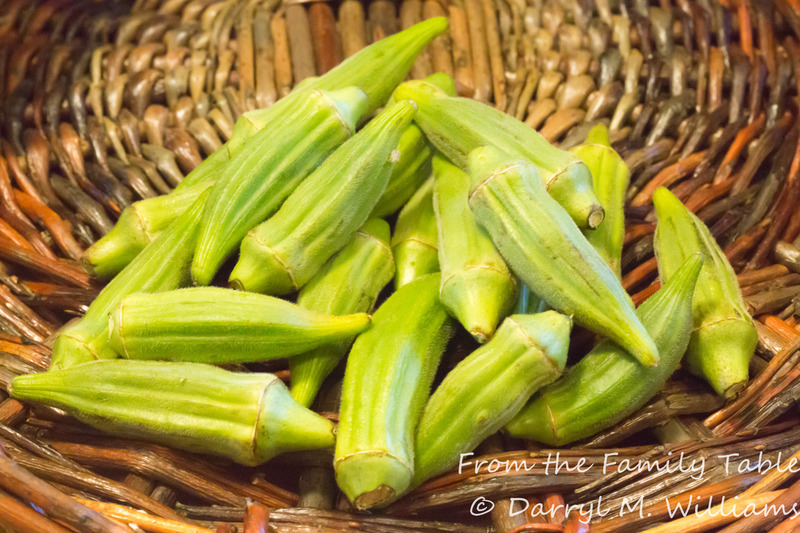 This last week my wife accompanied me to the farmers market, and for old time’s sake, she bought some okra. The pods were beautiful and small so they promised to be tender and delicious. I deep-fried a batch last night, and neither my wife nor I was disappointed. Not a trace of slime. In a large bowl, mix together the flour, cornmeal, salt and pepper until well combined. In a deep, heavy pot heat 3 inches of peanut oil to 350° F.
Place the washed and dried okra pods in the egg and buttermilk mixture, coating them completely. One by one, transfer the okra pods to the flour/cornmeal mixture and then transfer to the heated oil, being very careful not to burn yourself. 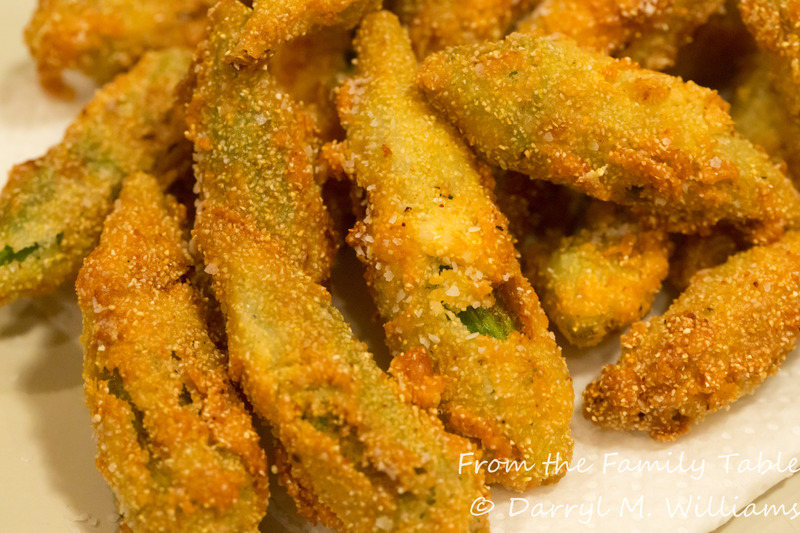 Fry the okra pods until they are well browned. With tongs, transfer the fried okra to several layers of paper towel to drain. Salt immediately. Keep warm in the oven at 170° F until all the okra is fried. Serve while still warm.